Looking to nature for inspiration (biomimicry) is nothing new. I've already covered turbine blades inspired by humpback whale fins and drag-reducing textures that mimic shark skin, so next up we have the elegant spinning maple seed. A growing trend among racecar designers is to use a 'swan neck' wing mount that attaches to the pressure surface of a wing. 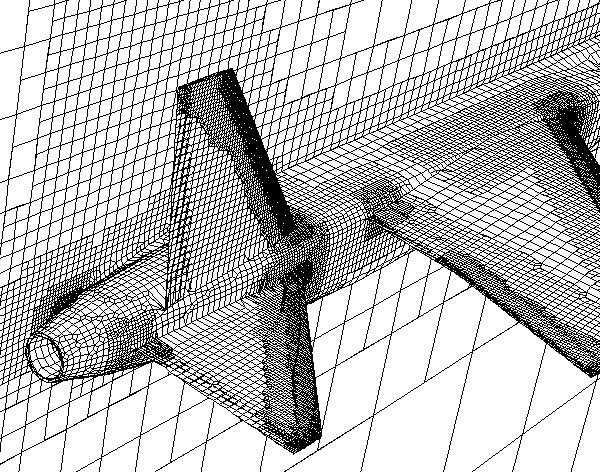 Historically wing mounts have connected to the suction surface of a wing. 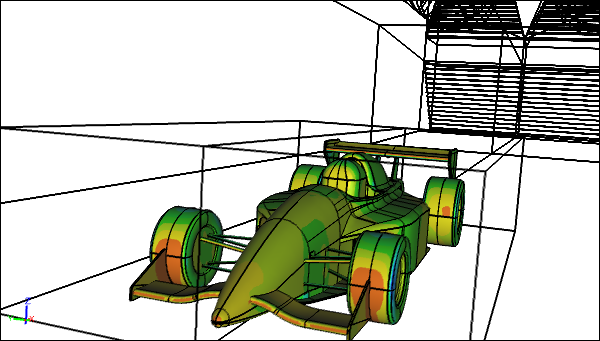 What difference does the wing mount strategy make to overall car downforce and drag? 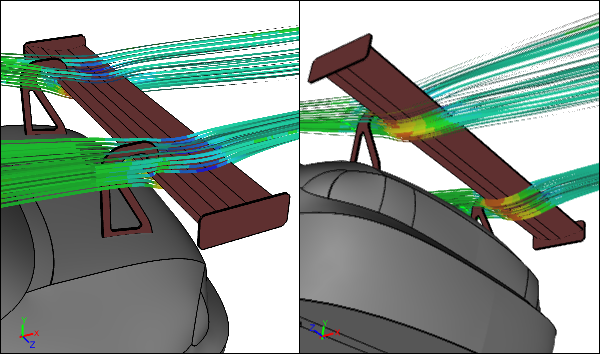 Let's investigate using Computational Fluid Dynamics (CFD) on a BMW Z3 - the same model I used in a previous CFD study to show how effective adding a wing is to increase downforce. What difference will adding a rear wing to a car make? You can expect an increase in downforce, equivalent to a reduction in lift, and an increase in drag. 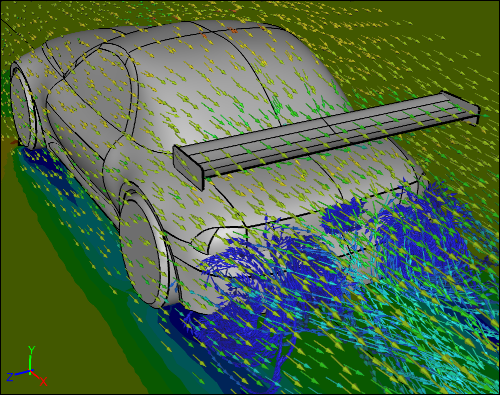 To quantify these effects I simulated the aerodynamics of a BMW Z3 using Computational Fluid Dynamics (CFD) without a wing and with a wing. 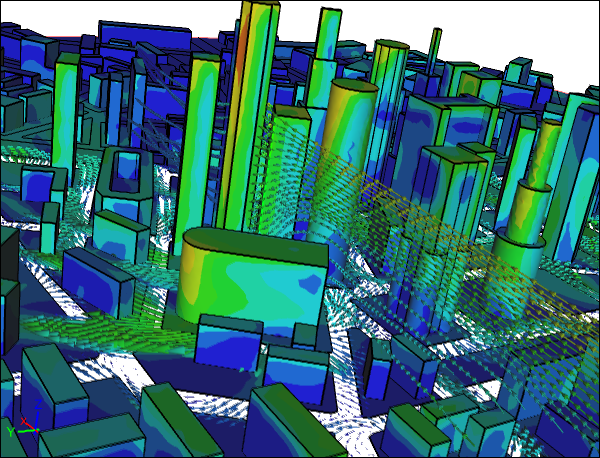 Given the availability of Computer Aided Engineering (CAE) analysis tools, such as Computational Fluid Dynamics (CFD), it is a surprise that analysis tools are not used more by architects during building concept design, especially relative to the local environment around a building. 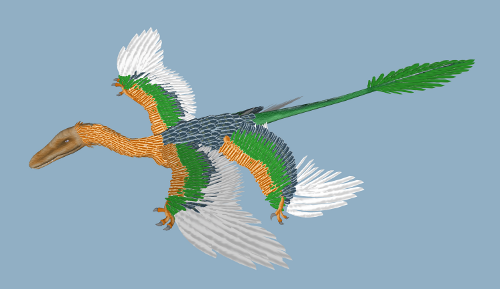 Researchers at the University of Southampton have tested a model of a Microraptor (a feathered, four-winged dinosaur) in a wind tunnel and found that it was optimized for slow gliding. Its multiple wings performed the same function as a modern-day, high-lift configuration used on airliners for takeoff and landing. There are many erosion processes that relate directly to either water or air flow. And if it flows, then Computational Fluid Dynamics (CFD) can help. So it should come as no surprise that CFD was used to better understand and predict the wind erosion on the Great Sphinx in Egypt. 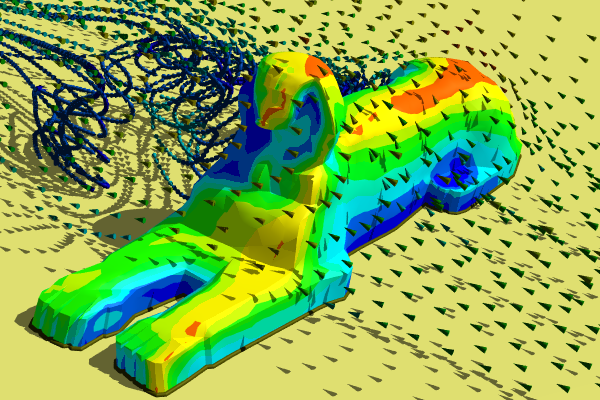 The ease of Cartesian or wrapper-based meshing for Computational Fluid Dynamics (CFD), including immersed boundary methods, is predicated on having a suitable surface mesh (e.g., STL) as an input. That surface mesh has certain constraints that, if not satisfied, will either cause a poor final mesh or can cause the Cartesian meshing process to fail. Often in a Computational Fluid Dynamics (CFD) study you will find yourself repeating a series of operations that are prime candidates for automation. For instance, performing an angle of attack (alpha) sweep for an airplane configuration is a great example where automation can be a significant time saver as I will demonstrate. Pitot tubes are critical devices used to determine the airspeed of an aircraft. 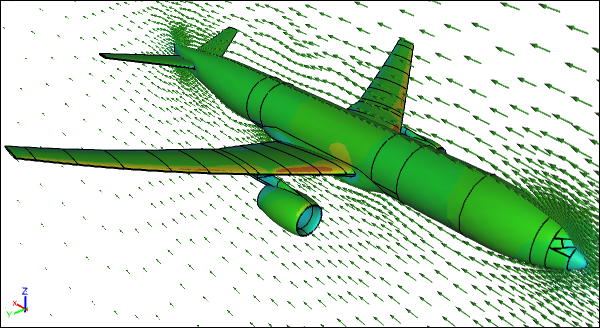 In aerodynamics it is important to know the speed of an aircraft relative to the surrounding air to alert pilots to stall conditions. Pitot tubes are also used in wind tunnels to determine airspeed, sometimes using a manometer to measure the pressure difference between static pressure and total pressure to determine the dynamic pressure. 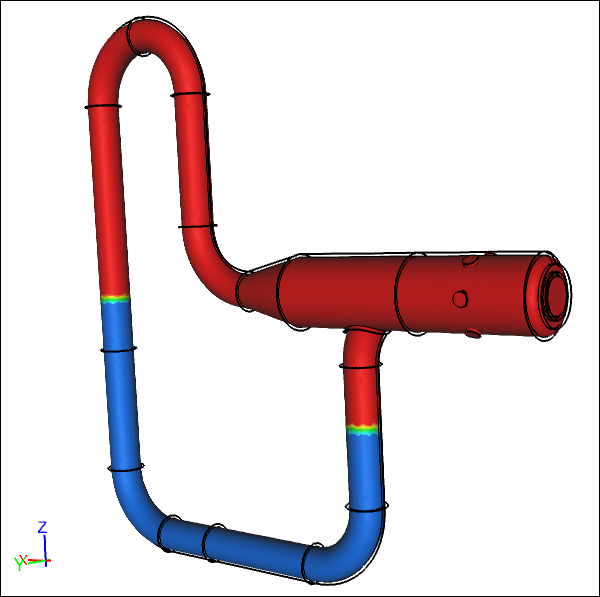 I thought it would be interesting to see if we could simulate a pitot tube connected to a manometer (two-phase flow, air + water) using Computational Fluid Dynamics (CFD) and to share my findings with you. 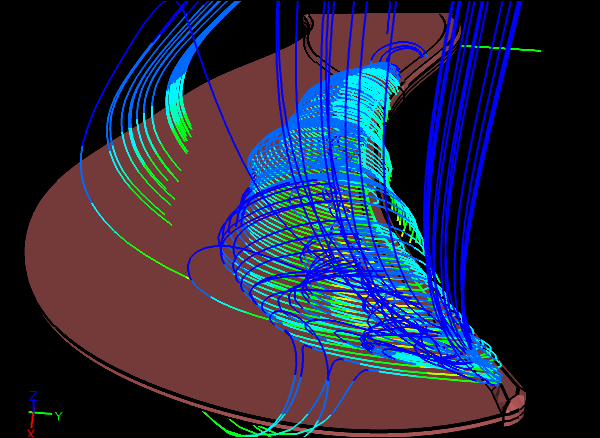 Welcome to the concluding episode of my two-part project to compare results between the virtual wind tunnel and free air using a series of Computational Fluid Dynamics (CFD) simulations. Recall that the previous post outlined the free air tests and expectations for the comparison. Here I present the results and conclusions.